Emperor and Empress, Lord and Lady, Motherhood and Fatherhood, Trump 4 and 3 do a beautiful dance together. If the Empress represents fertility, birth, motherhood and nurture, then the Emperor represents strength, stability, boundaries and protection. 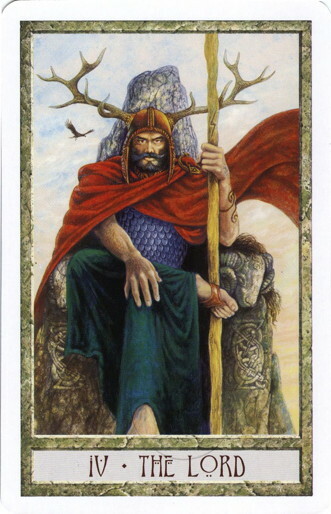 If the DruidCraft’s Lady channels the Divine Feminine, then its Lord channels the Divine Masculine whom Jesus called Abba, which is Aramaic for Daddy. The Rider Waite version of the card is quite straightforward with minimal symbolism. The Emperor is seated on a granite throne with giant rocky mountains behind him. Does that scream stability and strength, or what? The throne is flanked with four rams heads, the zodiac sign for Ares, which tells us the Emperor is a natural leader. One the positive side, he is adventurous, energetic and courageous. On the negative side, he can be headstrong and aggressive. Therefore, when this card appears it asks us to reflect on what kind of “Daddy” we are to those who are placed in our care and supervision. Hopefully, we will exhibit the highest and best qualities of the Divine Masculine and not abuse the power we’ve been given. Depending upon the reading, this card can also tell us there are powerful, protective forces that are watching over us as well! The DruidCraft version of this card is the one I prefer. 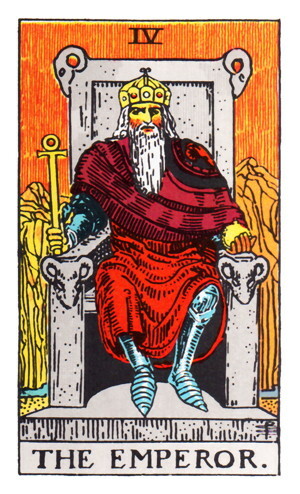 Arthur Waite says that The Emperor signifies “the higher kingship, occupying the intellectual throne.” We see this in the wooden staff he holds which corresponds to the suit of Wands. This gives the Lord the attributes of enthusiasm, adventure, risk-taking and confidence. Wands involve the intellect, learning, teaching, knowledge, enlightenment, divination. This brings a richness and depth to this card that is missing in the Rider Waite version. I also think the Lord’s face speaks of a strong protector, but with one leg crossed over the other he also had a soft side. It’s all about balance. A Christian way to look at qualities of the Emperor is think about the Lord who led the Israelites through the desert to the Promised Land in the book of Exodus. This Abba did so with great power (guiding them with a pillar of could by day and a pillar of fire by night) but also with tender care (providing water, manna and quail along the way). This card reminds us that the Divine Presence will do the same for us when we find ourselves wandering through the desert times of our lives.